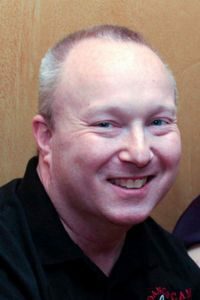 Don Schanaberger started his DJ career on the radio at WCBR FM in the early 90’s. He was an on air personality for several radio stations in the Chicago area until 2001. Don began dancing West Coast Swing in 2009. He was the winner of the 2011 DJ Challenge at Swing City Chicago and has been a DJ for various Chicago area dances including: Chicago Rebels Swing Dance Club, West Coast Wednesdays, and The Mix Dance. Don has been a DJ for Danzapalooza Chicago, The Chicago Classic, Floor Play Swing Vacation, Swing City Chicago, and serves on the planning committee for a local area dance convention called, Dance Camp Chicago.